Don't read this review unless you've read The Hunger Games! 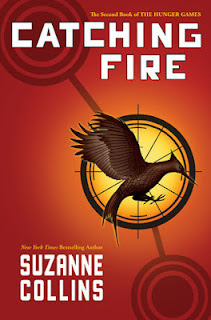 It's pretty incredible how fast I read Catching Fire – I think it took me just over a day! Usually, when I read a novel this fast, my enjoyment is almost palpable. I'll enter a review spewing out how much I loved reading every second of it, saying that I finished so quickly because I couldn't bear to put it down. The second statement is more than true. Much like with the first book in the trilogy, I felt compelled to read on, and it had a lot to do with the punches that come at the end of each chapter. They're mostly magnificent revelations or discoveries that come to Katniss one way or another, urging the reader to move forward and find out what she's going to do next. But even with all these twists and cliffhangers, I still found Catching Fire dull at times. Some of the novel repeats a lot of what happened in the first installment, only adding in different circumstances. It didn't pick up and become truly exciting until around the last sixty/seventy percent. Katniss also has a tendency to get on my nerves. While I admire her enormous strength and courage, sometimes her stubborness is frustrating. But I understand why she needs to be tough, and why she needs to put up walls: for self-preservation. Living in a nation overwhelmed with turmoil and fear, who can blame her? The ending is what saved Catching Fire, because what happens is highly unexpected and spectacular. It's definitely worth sticking through some of the monotony of the earlier pages to reach it. There are even sections that I've highlighted so that I can go back and revisit them later on, which is something I didn't do with the first book. 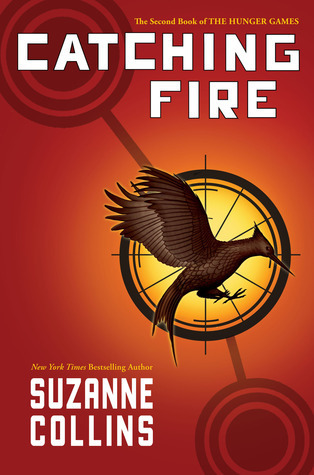 Altogether, Catching Fire is good, even though the first half lets it down slightly. The review for Mockingjay (book 3) will follow in the next few days.